Hydraplenish® with MSM / 60 Vcaps - Nature's Way®. BioCell Collagen® is a registered trademark of BioCell Technology LLC, Newport Beach, California USA (U.S. patents 6,025,327; 6,323,319; 6,780,841; 7,091,180; 7,799,348; other U.S. and foreign patents pending). What is the source of the BioCell Collagen Complex (Hydrolized Collagen Type II, chondroitin sulfate, hyaluronic acid) in Hydraplenish? 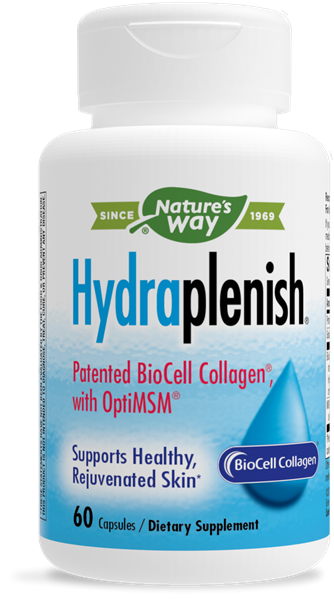 The BioCell Collagen complex (Hydrolized collagen Type II, chondroitin sulfate, hyaluronic acid) in Hydraplenish is derived from chicken sternum.